I generally dislike the word “crazy.” I don’t like how disparaging and dismissive it comes off. I know it’s become one of those words, like “sick” or “bad” or “dude,” that means fourteen different things depending on your tone, word placement and angle of your hat. But the amount of “crazy” that’s shown up in my inbox recently is startling. Let’s stop calling women “crazy” (here and here) (also, yes, let’s, but that’s not my point here). Let’s stop telling people a food-lifestyle choice is “crazy” (be gluten free, or paleo, or raw, or vegan. I don’t care). But animal people: for the love of Pete, let’s please stop calling each other crazy. You like cats? Have 20 cats, but only if you can properly care for them and feed them. You want to dress your pig in a bathing suit and film her playing a keyboard? Please send me a link. You rescue or adopt or go to a breeder for your dog? Fine, I’m not going to judge your choices; really, I’m not. Do the best for the animals you have. I am an over-achiever. This is Fact. 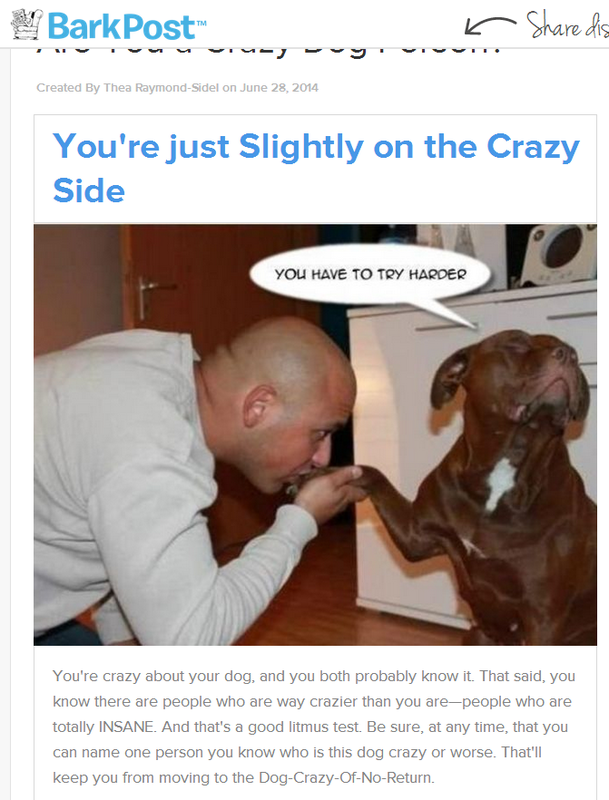 When my crazy result is “Slightly,” I covet the craziness of others and I go overboard. And that’s not healthy for anyone. So how about we just accept the love and affection and obsessiveness we have toward our furbabies at any extreme?